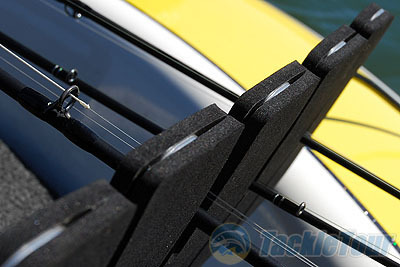 Introduction: The Bac Rac is a new portable rod rack for bass boats that weighs just over a pound and installs onto the rear deck in just a few seconds. This innovative storage system allows co-anglers to carry more rods and have easier access to their rigged outfits. Impressions: Let�s face it Bass anglers love tackle, part of the allure of the sport is that we have a tool for just about every application. Unfortunately carry and organizing all that tackle can sometimes be somewhat of a challenge, especially if you are riding shotgun on your buddy�s boat. 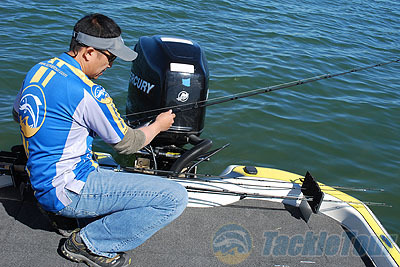 Most bass rigs have a rod ramp on the passenger side of the boat which can store up to six rods. This is great if you are just fishing with two anglers on a boat but if you�re the third angler you pretty much have to share space and cut your rods down to two or three outfits. The rod ramps on most boats also often require anglers to step down from the rear deck to stow and draw fishing combos. The Bac Rac is designed to address these issues and is the latest innovation to come from Central Coast Bass Fishing, the same company that introduced the Cool Foot for trolling motors. 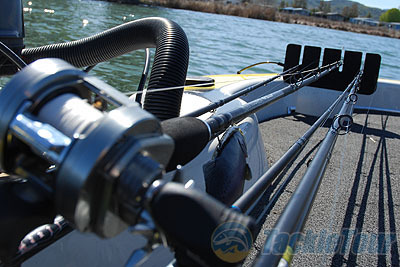 Intended for use on bass boats the Bac Rac is a lightweight and easy to install system that can hold four rods horizontally over the top of the rear deck. The Bac Rac is constructed out of aircraft grade aluminum which is powder coated and layered with EVA foam in areas where rods or reels come in contact slots. The Bac Rac is designed to be held in place on either side of rear compartment, which usually provides access to the batteries and pumps. No drilling is required and the lid is what holds the Bac Rac in place. 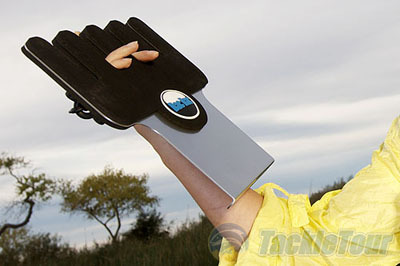 We decided the best way to evaluate this unique watercraft accessory was to simply go fishing. Real World Tests: To test the Bac Rac we went fishing on both Clear Lake and the California Delta and tried the system on three different makes of boats including Triton, Skeeter and Legend. We tested the entire setup and breakdown process as well the Bac Rac�s ability to hold rods in rough water and during extended high speed runs. Setup and Performance: So why the name �Bac Rac?� The play on words becomes clear when you see the nylon bag that the two sides of the system are transported in. Calling the bag a back pack is a little bit of a stretch but it can be carried on your back with the two drawstring straps. We found it easy enough to carry the lightweight system with our hands or stuffed into the back of a tackle bag, but having the option of carrying it on your back does free up your hands to carry rods in and out of your car to the boat. The installation is both easy and straightforward.